I attended a free driving class last December sponsored by the Dongdaemun Multicultural Center. The classes were for the written exam part and were conducted in Korean. Although Iâ€™ve been living in Korea for more than a decade, I am not fluent enough to understand everything taught in that class. Iâ€™m planning to take the test anytime this year, though. Itâ€™s a good thing that the written part of the exam is available in English. 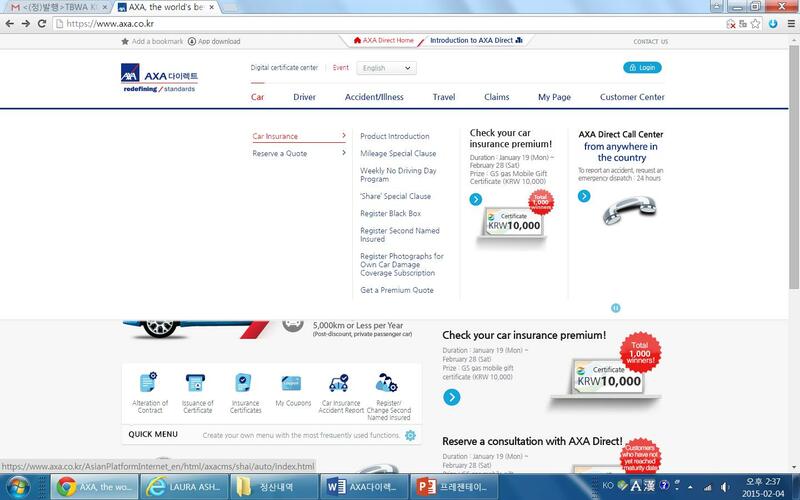 If youâ€™re planning to drive in Korea, one of the things that you NEED to get is car insurance. It could be tricky if you couldnâ€™t understand what youâ€™re signing up for. 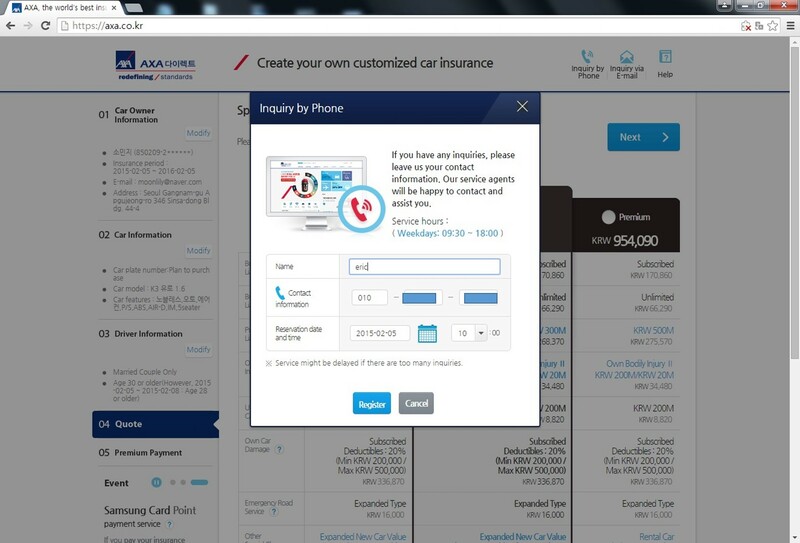 Fortunately, AXA Direct just opened up a detailed English insurance website. AXA is a global insurance brand, with 100 million customers in 56 countries worldwide. They have been chosen as the No. 1 insurance brand for 6 years in a row by â€œInterbrandâ€, the reputable marketing institute that ranks the global top 100 brands. Personally, itâ€™s important to choose a reliable brand when it comes to insurance. 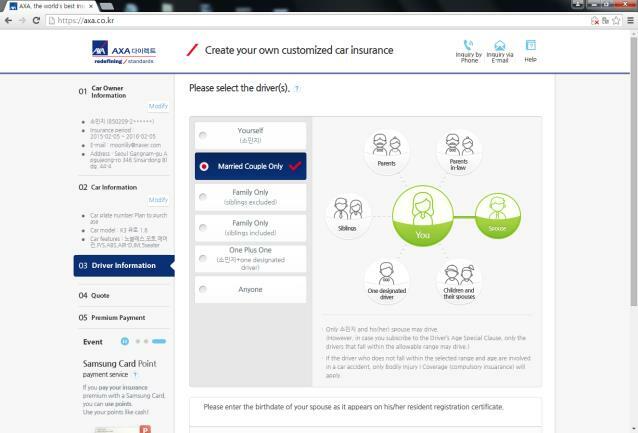 Visit the AXA Direct website and choose â€œEnglishâ€ from the language tab on top. Many times when I visit the English site of a company, I only see information on the company itself and nothing useful about their services. I like that the English website of AXA Direct is very detailed and one could easily get information. 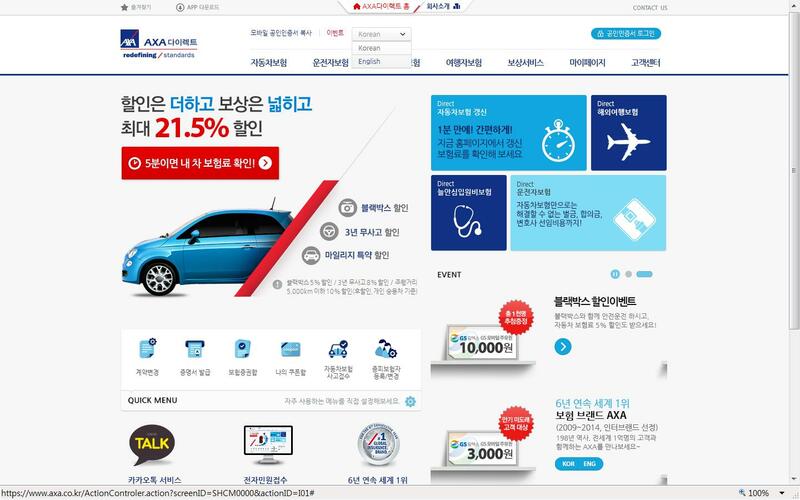 In Korea, AXA insurance provides English quotes, service type confirmation, signing up and much more, all in English on the new site which makes it very accessible to expats in Korea. Step 1: Enter your name and registration number (as in your ARC), phone number and tick on the â€œAgree to allâ€. 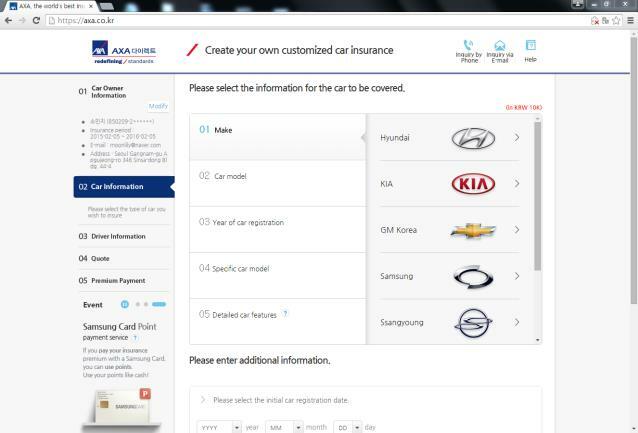 Step 2: Enter your car information by selecting the model and additional information. Step 3: Enter your driver information. 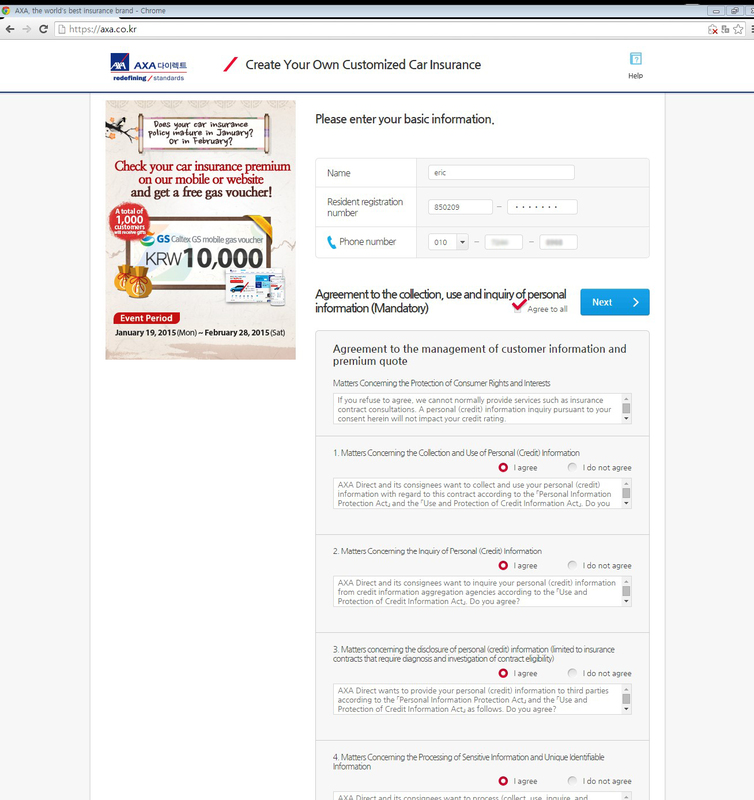 Step 4: Get your quote instantly! If you find any difficulty, you can also press â€œRequest a Callâ€ and book a consultation call with English-speaking agents. Great, isnâ€™t it? Getting a quote online, right after entering the needed information, gives you the assurance of not overcharging ~ which could happen if you just say yes to options you donâ€™t understand. In case of a traffic accident, AXA DIRECT provides a thorough and reliable claim service ~ in ENGLISH! They have a hot-line dedicated for English speakers, providing accident report and emergency road service. Thatâ€™s a relief since it would be frustrating if one has to struggle in Korean after being in an accident. 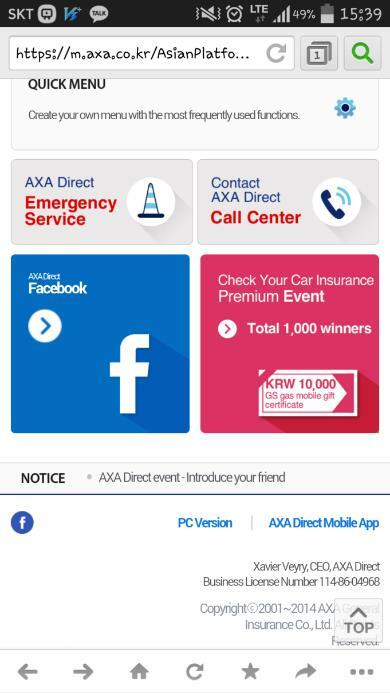 AXA also offers quick and easy mobile service for accident report. 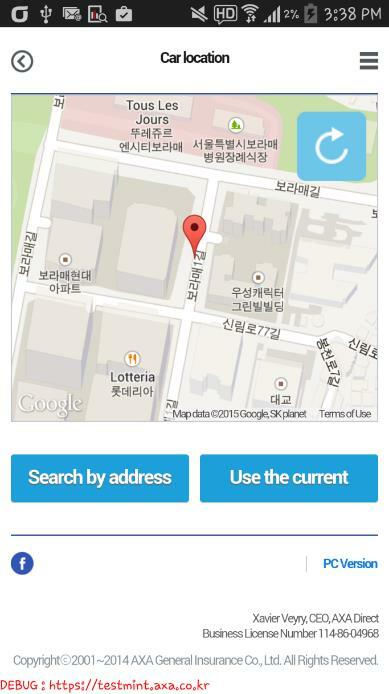 You could do it right where it happened ~ on your mobile phone. Just click on â€œEmergency Serviceâ€. 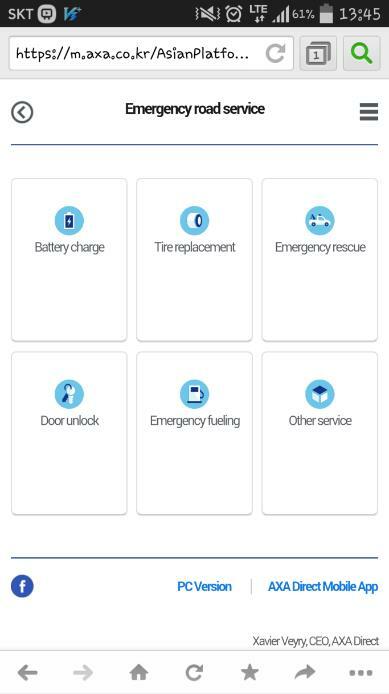 Choose your emergency and tap your location on the map. AXA will come help you with its easy and reliable care. 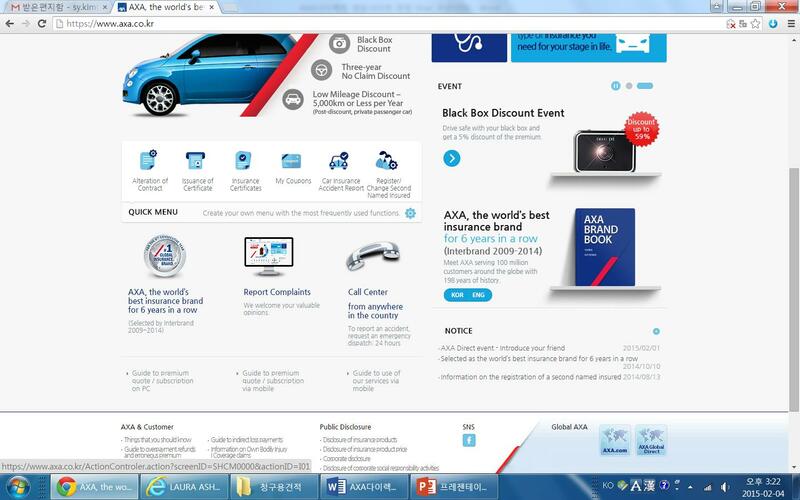 Aside from a valuable English website for non-Korean speaking expats, AXA also has discount programs with some items that you could take advantage of. 1. 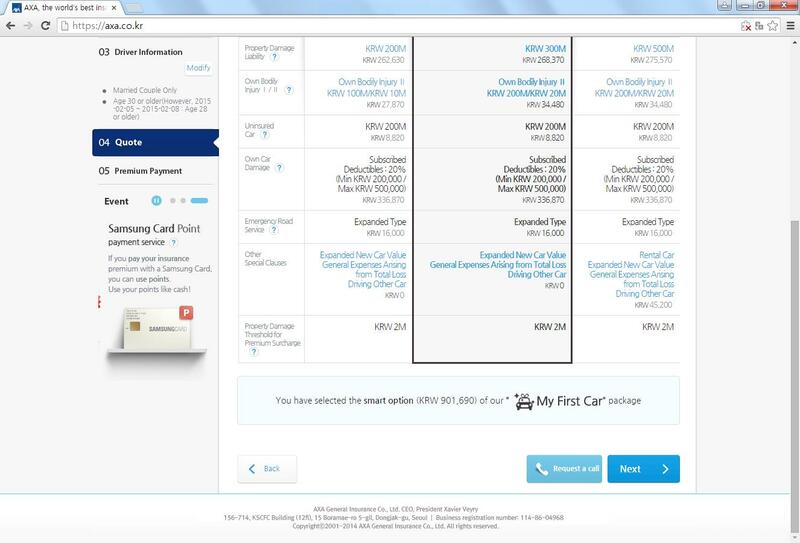 Mileage option ~ you pay as much as you drive and get additional discount for driving less. Example, 10% off for driving less than 5,000 km, 5.6% for driving less than 9,000 km. 2. Black-box registration discount ~ if you drive with a black-box. 3. Accident-free discount ~ for those who drive accident-free for 3 years. 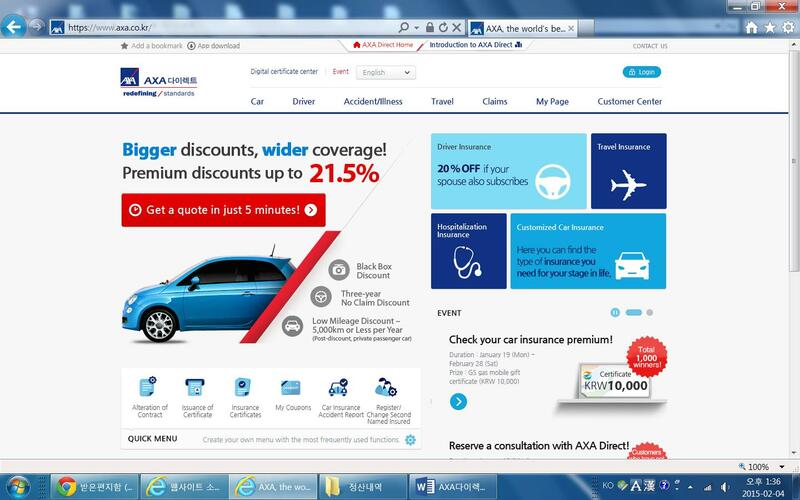 Find out more about the discounts by visiting AXA Direct now. Reliable English service by a reliable insurance brand! Click the link below and go find more about AXA.